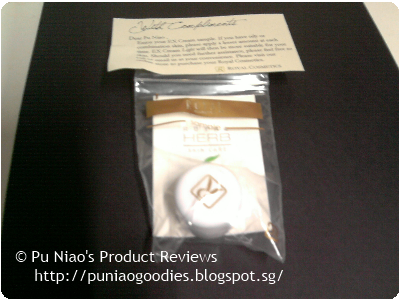 As promised in my previous post, I will do a review on my own little pot of gold called Royal Cosmetics Royal Herb EX Cream. 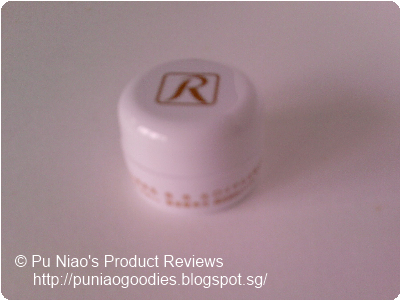 I received this awesome little pot of gold in my mailbox after requesting for a sample via Royal Cosmetics website. It comes in a cool black envelope, seriously, how cool is it? A black envelope, I've never ever saw black color envelopes in any bookstores I've went to, and it's actually a unique and mysterious touch to what goodie is inside it. 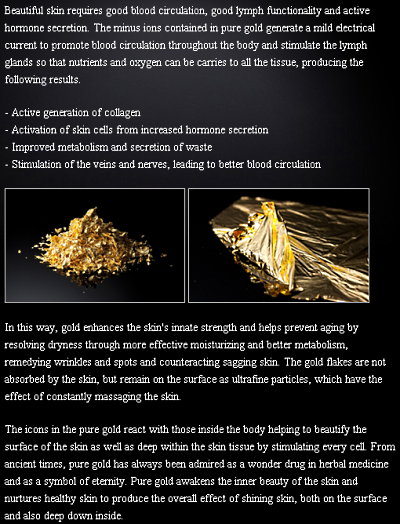 Royal Cosmetics Royal Herb EX Cream: The EX Series represents the quintessential balance between nature and science, fusing gold flakes, herbal elements and Aqua-Biomin Complex to accelerate cellular regeneration, which restores and maintain skin radiance, clarity and luminosity. 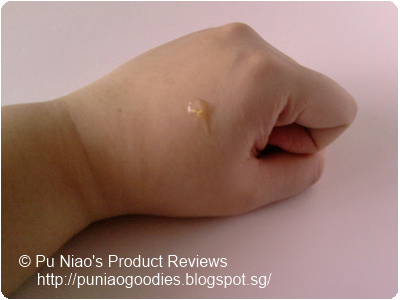 As you can see in the image above, it's a clear gel with plentiful of gold flakes in it. If this glorious little sample already has that much gold flakes, I'll die of ecstasy if I get my hands on the retail version!! Applying a dot of it on the back of my hand. I just love how the gold flakes captures the sunlight on it. Facial product with the bling factor! 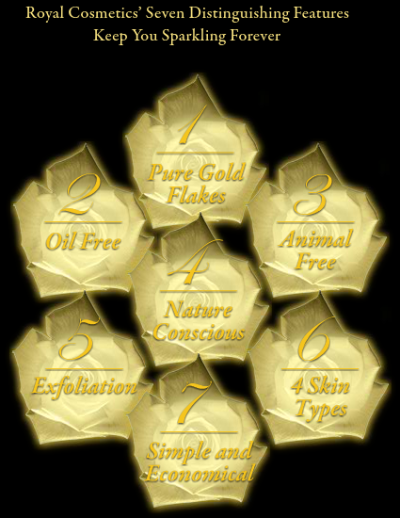 WHAT IS ROYAL COSMETICS: Royal Cosmetics products redefiine beauty with pure gold. And it regenerates, hydrates and illuminates after application. But why Royal Cosmetics, you may ask? Read on to understand more. To understand the importance of oil-free and plant-based ingredients in cosmetics products as mentioned on Royal Cosmetics website, we would first have to look at the issue of toiletries that are toxic to our skin, instead of being beneficial. When researching cosmetics chemicals/ingredients and the toxological data for the, we can refer to what is kown as a Material Safety Data Sheet (MSDS). This is the industry standard for providing information about a specific chemical or substance. These are easy to find online: either simply type in the ingredient name followed by MSDS (for example, sodium lauryl sulphate MSDS) into search engines, or look up the MSDS on a specialist website. The most important point to keep in mind is that an MSDS only gives information based on the industry use of that substance, so if toxological data specifies that an ingredient is a known carcinogen or irritant, then this will be based on studies using the undiluted form of that product. Sounds scary? Bear in mind that it is not so much the individual chemical that will cause harm but rather that the daily systematic onslaught of several hundred of these ingredients over a long time will undermine the health of the body. Most synthetic cosmetic chemicals have only been tested individually and for short-term effects and no one really knows how these different ingredients and chemicals all react together on the skin and in the bloodstream day after day, for years and years. As I always like to say, "Be beautiful and alive, not dead but beautiful". Why kill yourself by using oil-based and animal-based beauty products when achieving flawless skin isn't really that hard? My sample came alongside a sweet little note that is actually personalized to include my name too, how sweet is that? And unlike most samples that comes in satchets that can sometimes get a little messy when opened for usage, and you are kinda stuck in between whether you should just run out and buy a cosmetic refill bottle to store it or not, my Royal Herb EX Cream came in it's little pot. Easy, convenience, mess and spill free and I can re-use this cute little pot when I am travelling or have to go outdoors for extended time and cannot possibly bring a huge bottle with me. And it also comes with a instruction leaflet that tells you just exactly how easy it is to use and apply. I applied Royal Herb EX Cream right after showering and it gets absorbed rather quickly into my skin. 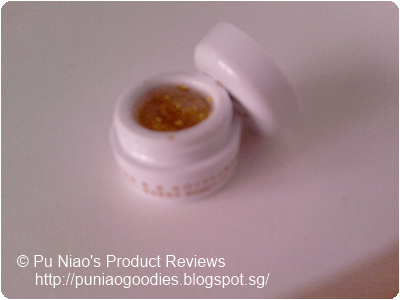 In fact, I was hoping that everytime I applied this product on, the gold flakes would leave the sample container, goes onto my finger and lands on my face. 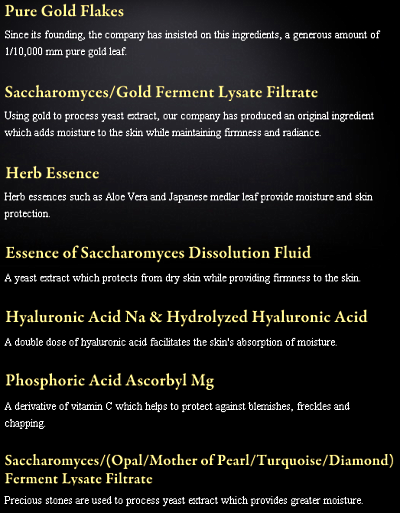 I'm talking about pure 24k gold in Royal Cosmetics products here. 24k, nothing less. After a few days of using this product, my face looks better (the pimples can't decide whether they want to disperse or just turn ripe and has been in the same situation for over a week) and a little more radiant than before. Although I have to say, the price is too steep for my pocket. WHAT I THINK: Beauty is something felt easily. 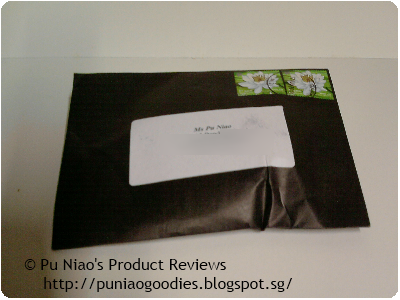 WHERE TO REDEEM A SAMPLE: If you want to give simple and fast skin care a try, you can redeem a sample a.k.a your little pot of gold flakes via Royal Cosmetics site at http://www.royalcosmetics.com.sg/en/inquiries/. Oh, do go over to Royal Cosmetics Facebook page at https://www.facebook.com/RoyalCosmetics and Like their page too.